I try to travel with hand luggage whenever possible so I’m always on the lookout for clothes that are both chic and practical; they don’t wrinkle and are comfortable for travelling. If the objective is to pack light, a few key pieces for business and pleasure can make life a lot easier while travelling and at the destination. Here are five of my recent acquisitions, one of which is for men. 1. The “miracle” range from Winser is not only super flattering to any body type but crucially, for travel, doesn’t wrinkle. There are dresses, trousers and skirts that work well for day or nightwear. The fabric in the miracle range is ponte di roma, a double-knit jersey fabric with lycra which gives a four-way stretch and it’s thick enough to cleverly hide any lumps or bumps. I have a pair of classic black “miracle” trousers and a gorgeous green “Natalie” dress from the Spring/Summer 2019 collection. The dress is a classic shift dress with a collar and pockets, which I always appreciate in a dress. The trousers have a flat waistband and no side seams that appear to miraculously lengthen the leg and flatter the bottom. Both items have already travelled with me in my small carry on bag and have not required ironing. The miracle line is simple, elegant and easy to style with jewellery, handbags and shoes. Winser was set up by Kim Winser in 2013, after a career in fashion retail that included leading roles at Marks & Spencer, Pringle of Scotland, Aquascutum and as adviser to Natalie Massenet at Net-a-Porter. 3. When Paul tried on the “Everyday Shirt” from Hardvark, he refused to believe it was made of wool until I showed him the label. It is so soft that it almost feels like silk. Hardvark shirts are made of merino wool which is softer and more elastic than any other type of wool, plus it’s naturally antibacterial and environmentally sustainable. Hardvark was founded in 2014 by J.J. Symons who left his London finance job to create something he couldn’t find anywhere: versatile, durable, easy-to-care-for clothing that didn’t sacrifice style. While cotton shirts are the ubiquitous choice at most major retailers, they are prone to wrinkles, moisture saturation and odors; plus, a wardrobe full of cotton requires a lot of washing and ironing—and a lot of shopping for extra clothes. So Mr. Symons decided that high-performance merino sourced in Australia and New Zealand was the ideal choice for a shirt that was super functional and stylish. He spent two years perfecting the shirt, launching the first one in 2015. In essence, this is the ideal travel shirt that works for business meetings, an outdoor stroll or a more formal dinner. The shirt is breathable, durable, packable and all their garments are handcrafted in Europe by skilled craftspeople with a mastery of merino wool techniques. Better still, the shirts are all stretchable and machine washable. Paul has a finely striped teal Everyday shirt which he loves and Hardvark offers a wide range of colors from blue and red to navy and black, in solids and patterns, including gingham, checks and stripes. 4. A navy blue cashmere wrap from Travelwrap is so soft, beautiful and comforting that I’m tempted to use it on a daily basis. For travel, I was looking for something chic yet practical so I could avoid using what studies have shown to be fairly filthy airline blankets (even the ones sealed in plastic are a cesspit of germs). Niamh Barker, the founder of the Travelwrap Company, had the same thoughts. During her previous career in the pharmaceutical industry she traveled a lot and hated the idea of those blankets. She told me that she “used to wonder who had been sick on it before it got to me!” Before founding Travelwrap, Ms. Barker spent 18 months looking for the right mill to knit the wraps because she wanted the cashmere to be the most luxurious available, in a range of colors and patterns. Plus, the cashmere had to be sustainably sourced. She decided on Johnstons of Elgin, a 200-year-old Scottish company that has a well-deserved reputation for producing the finest cashmere in the world. 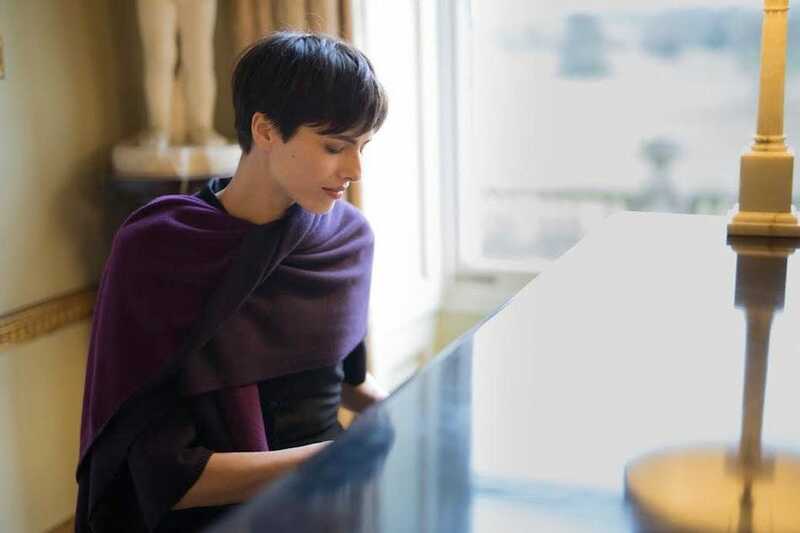 Today, there are 35 cashmere travelwraps to choose from in a range of color palettes, designs, knits and weights, with the aim of launching seven or eight new travel wrap collections a year. 5.Yaitte, a new women’s clothing brand founded by Danielle Jade Windsor, offers a lovely range of tran-seasonal ready-to-wear items, many of which are ideal for travelling. After studying at the Domus Academy in Milan, Ms. Windsor worked for Viktor & Rolf, Matthew Williamson and Zara before founding Yaitte (Spanish for “yacht”) in 2017. 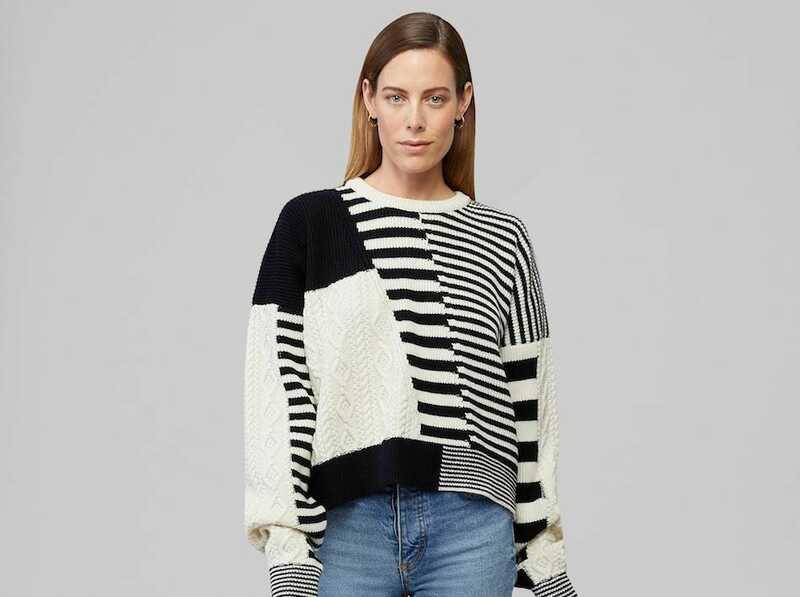 I was looking for a sweater to wear with my Winser black trousers and the black-and-white wool patchwork sweater is ideal as it’s super warm for plane/train travel in cold cabins and can be dressed up or down for city breaks and cooler climates.